+ Sign up for our e-mail newsletter! The 66 Series Recliner is ruggedly built like our classic recliners, with added style and elegance. Gently contoured lines enhance its profile while comforting patients up to 500 lbs. 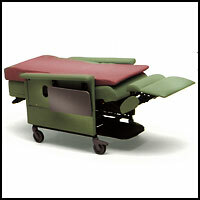 Standard swing-arms provide easy cleaning, maintenance and patient transfer. Four-inch, dual, thermoplastic casters are corrosion resistant and roll with ease. 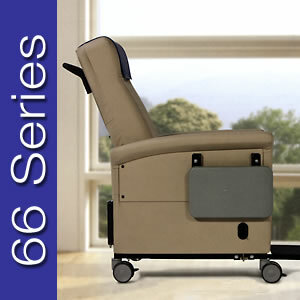 The 66 Series is a great patient seating solution for oncology, dialysis, nocturnal therapies, pre/post op, infusion therapy, patient rooms and other treatment needs. Nocturnal Pad provides a comfortable, flat surface, enabling you to use the same recliner for daytime treatments and overnight sleeping. • Designed to fit any Champion Medical Recliner. The cushion wedge narrows the Medical Recliner seat by four inches, helping to reduce arm fatigue and improve overall patient comfort. 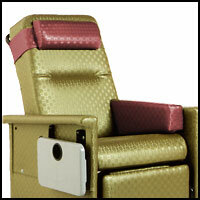 Your patient will be warm and comfortable sitting in a Champion recliner equipped with the new warming system. Either patient or caregiver can use the easy-touch system to control the temperature. 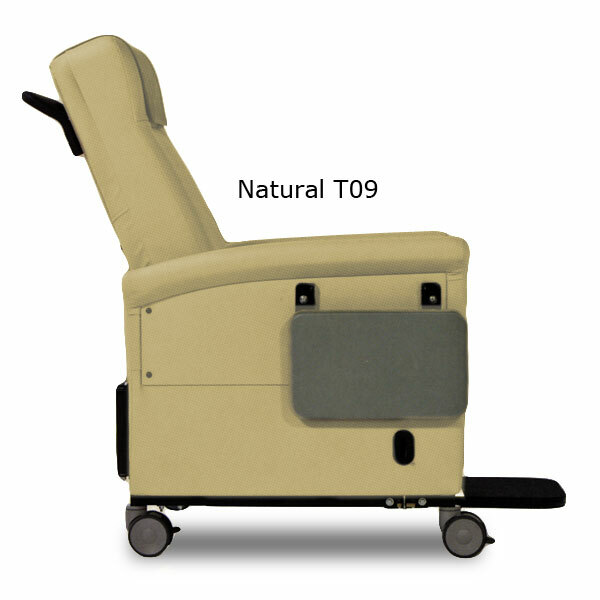 Presets of 95°, 100° or 105°F (+/- 2° F) help keep patients comfortable, and a one-hour shutoff helps control operational costs. 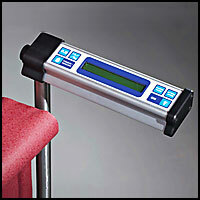 Champion's integrated scale allows you to continuously monitor patient weight change throughout treatment. Reduce the potential for patient falls and staff injuries that can occur when walking the patient to and from a remote scale. 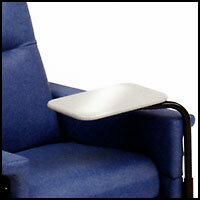 Staff can record patient weight data chair-side for improved accuracy and efficiency. 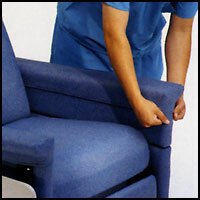 Ask about retrofitting your existing Champion Chair! The over-the-lap tray makes it easier and more convenient for patients to enjoy any number of activities including reading, games, meals and snacks. 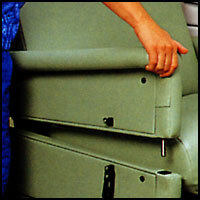 It is simple to put in place, remove and transfer to another recliner. 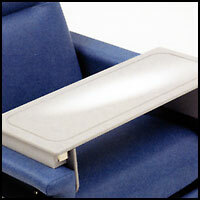 The swing-away table rotates a full 360 degrees and remains attached to the chair. this makes it easy and convenient for patients to enjoy any number of activities during treatment. It also assists caregivers in administering treatment. 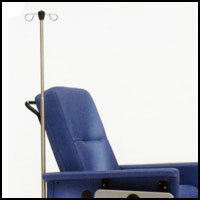 IV Poles are available in two hook or four hook versions. Easily mounted to the recliner and simple to use, the brackets simplify management of infusion therapy and assist in saving floor space. A rolling base IV pole is also available. The breakaway arm makes it easier to transfer patients to and from a wheelchair of bed. It also gives caregivers easier access to patients during treatment. The arm covers decrease wear and tear on the recliner arms, making cleaning easier while increasing the life of the fabric. They are fitted tightly over the arm, providing improved infection control. 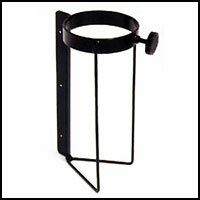 The oxygen tank holder can be mounted for increased safety and convenience. Colors displayed on computer monitors may not be an exact match to actual fabric colors and are enlarges to show detail. 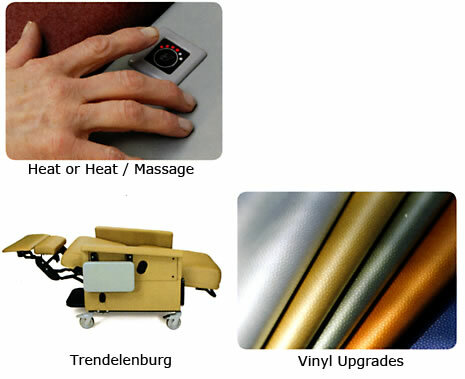 Please contact Dial Medical (800-346-2080) for a fabric / color samples to be sent to you. PLEASE NOTE: THE WARRANTY BELOW HAS BEEN DRAFTED TO COMPLY WITH UNITED STATES FEDERAL LAW APPLICABLE TO PRODUCTS MANUFACTURED AFTER JULY 4, 1975. This warranty is extended only to the original commercial purchaser who purchases this product when new and unused directly from Champion Manufacturing, Inc. or an authorized Champion distributor. This product is for commercial use only and Champion and this warranty do not provide warranty coverage to any consumer who purchases this product. This warranty gives you specific legal rights and you may also have other legal rights which vary from state to state. eligible for coverage under this warranty shall be proven to be defective, Champion will, at its option, either replace or repair the product, or will supply the customer with replacement parts. Champion will pay all Champion-authorized labor and freight charges for returns or replacements covered under this warranty. Champion's sole obligation and your exclusive remedy under this warranty shall be limited to such repair and/or replacement. THIS WARRANTY SHALL BE EXTENDED TO COMPLY WITH STATE/PROVINCIAL LAWS AND REQUIREMENTS. SOLELY BY CHAMPION. THIS WARRANTY SHALL NOT APPLY TO PROBLEMS ARISING FROM NORMAL WEAR AND TEAR OR FAILURE TO ADHERE TO THE PRODUCT INSTRUCTIONS. A CHANGE IN OPERATING NOISE, PARTICULARLY RELATIVE TO MOTORS, DOES NOT CONSTITUTE A FAILURE OR DEFECT AND WILL NOT BE REPAIRED, AS ALL DEVICES WILL EXHIBIT CHANGES IN OPERATING NOISE DUE TO AGING. CONTAINED HEREIN. THE APPLICATION OF ANY IMPLIED WARRANTY WHATSOEVER SHALL NOT EXTEND BEYOND THE DURATION OF THE EXPRESS WARRANTY PROVIDED HEREIN AND CHAMPION SHALL NOT BE LIABLE FOR ANY CONSEQUENTIAL OR INCIDENTAL DAMAGES WHATSOEVER; SOME STATES DO NOT ALLOW THE EXCLUSION OR LIMITATION OF INCIDENTAL OR CONSEQUENTIAL DAMAGE, OR LIMITATION OF HOW LONG AN IMPLIED WARRANTY LASTS, SO THE ABOVE EXCLUSION AND LIMITATION MAY NOT BE APPLICABLE.